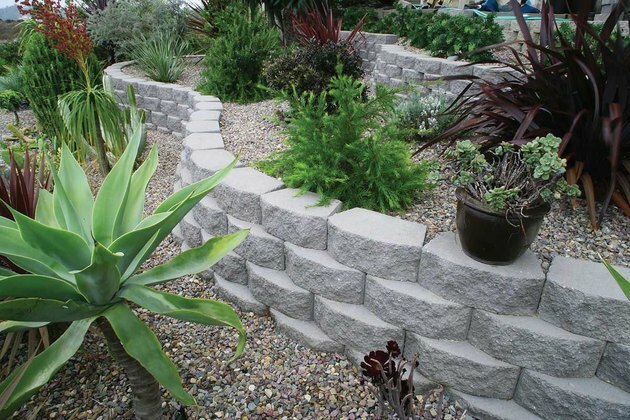 Retaining walls cut into sloping ground and are designed to support the soil behind the wall. Homeowners use them to reshape their landscapes, transforming sloped areas into flat spaces that are more usable for lawns, patios, garden beds or driveways and walkways. True to its name, a retaining wall has the primary job of holding back, or retaining, the soil, and it won't do this for very long if the wall is not built properly. Building a retaining wall can be a do-it-yourself project if you choose the right materials and limit the overall height to 4 feet or less (or 3 feet for stone walls). Retaining walls can be used to confine garden areas. Retaining walls are almost always used to deal with sloping ground, which is nice to look at but isn't much good for anything besides sledding or making yourself dizzy. By cutting into a slope with a retaining wall, you create a flat area below the wall and an elevated area above it. Gentle slopes usually can be reshaped with one short retaining wall. Steeper or longer slopes may call for multiple walls that create step-like terraces in the landscape, and each step of the terrace can become a planting bed or other feature. In home landscapes, shorter retaining walls are preferred over tall walls for a few important reasons. Tall walls create high, potentially dangerous drop-offs that may need a fence or other type of safety barrier. Also, as walls get taller they get exponentially more difficult to design and build. 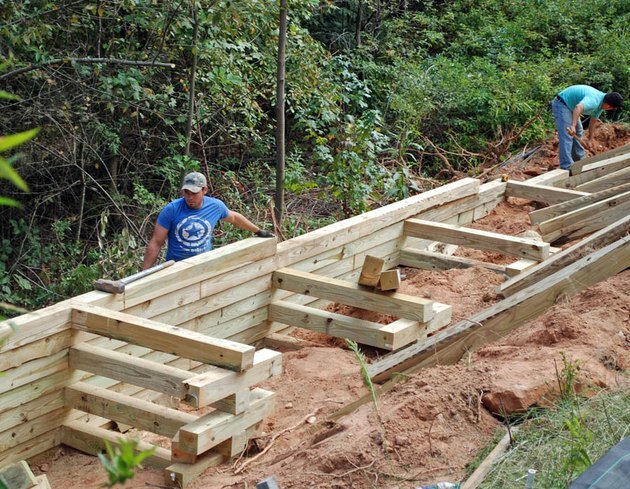 An 8-foot-tall retaining wall must be eight times stronger than a 4-foot-tall wall. Finally, a yard with terraces usually is more attractive than one with an imposing, cliff-like wall. Properly built retaining walls have some important behind-the-scenes elements that help the wall resist the considerable forces of gravity, hydrostatic pressure and erosion. Most retaining walls start several inches under ground to give them a toehold in the earth. Below the base of the wall is a bed of compacted gravel. This provides a stable surface that drains well and resists erosion as well as the ground movement caused by seasonal freezing and thawing. Providing for draining behind the wall is one of the most important requirements of retaining wall construction. As the wall is built up, it is backfilled with gravel to create a drainage zone directly behind the wall. This reduces the amount of water and saturated soil—which create hydrostatic pressure—that bear on the backside of the wall. A layer of landscape fabric between the gravel and the earth behind helps keep soil from drifting into and clogging the gravel. In some cases, there may also be a continuous landscape-type drain pipe, or drain tile, running behind the base of the wall to carry excess groundwater away from the wall. Another critical design feature of retaining walls is visible in the finished product. If you look closely, you'll see that most retaining walls slope backward slightly, as though they're leaning into the hillside. This is called batter, and it's created by stepping the wall materials toward the slope about 1/2 inch per vertical foot as the wall is constructed. This little bit of lean gives the wall added resistance against the weight of the soil and moisture imposed by the slope. Interlocking concrete block retaining walls. Retaining walls can be built with many different materials, including wood, concrete block, natural stone, poured concrete, brick and even steel. But most residential walls use one of three materials: wood timbers, interlocking concrete block, or natural stone. Wood timbers have a natural look and are relatively easy and cheap to install. They work particularly well for low retaining walls that create gardening space and for terraced walls, because they blend naturally into the landscape. The drawback of timber is that it naturally decays (even with good pressure-treated lumber) and may need to be replaced after 10 or 15 years. 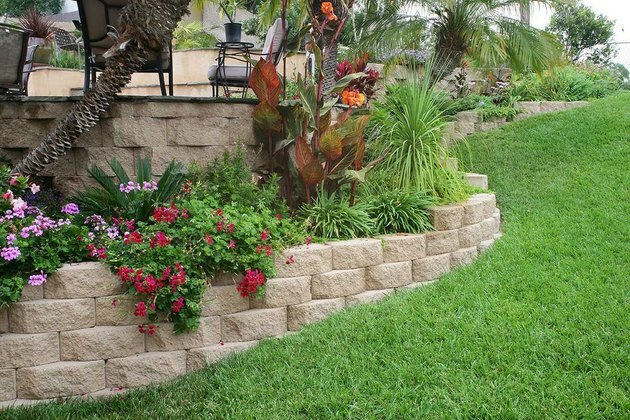 Interlocking concrete block, or landscape block, is the popular, uniform, rough-faced block you see on so many retaining walls in backyards, as well as in commercial and civil applications. Interlocking block is designed specifically for retaining walls and includes a lip at the bottom, rear edge of each block that interlocks with the block below and automatically sets the proper batter for the wall. Interlocking block is moderately priced and quick and easy to install, and it lasts indefinitely. The downside is that it looks like concrete block. 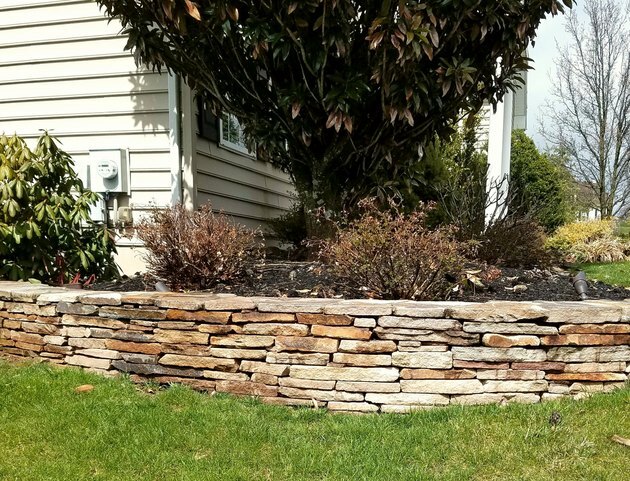 Natural stone retaining walls can be built with many types of stone; often the best choices are local stone that is both affordable (relatively) and readily available. Most stone retaining walls are simply dry-stacked stone built without mortar, and are similar in construction to concrete block walls. Stone is natural and long-lasting and is arguably the best-looking of all retaining wall materials. On the downside, stone is expensive, and it can be tricky to build stone walls that are as structurally durable as a concrete block wall. For this reason, dry-stacked stone walls typically are limited to 3 feet in overall height. Timber walls often use buried supports, called deadmen, that anchor the wall to the earth. 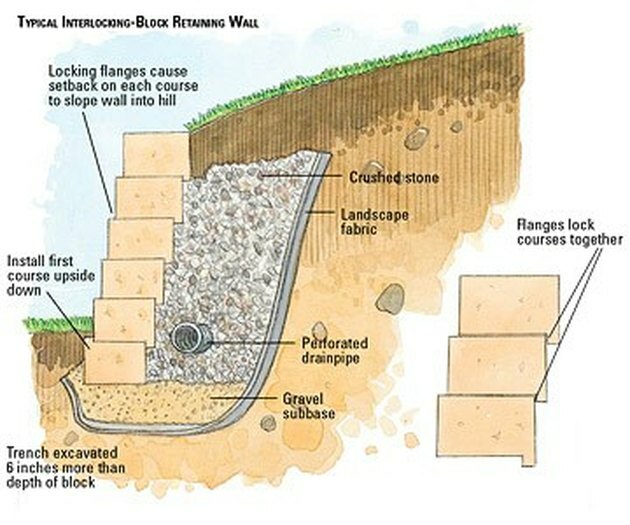 Before you hit the drawing board or start calling contractors for a new retaining wall, do a little research. Consider the different materials options in terms of the wall height, the desired look and the overall cost and long-term durability of the material. Also get in touch with your city's building department. Retaining walls typically must be approved by the local zoning authority. Sometimes you also need a building permit, but in many cases, retaining walls 4 feet and under are exempted from permits. Tall walls almost always need a permit and usually require an engineer's stamp and professional installation. Retaining walls for home landscapes typically are built by landscaping contractors, since these are short walls that don't need engineering or major heavy equipment. Assuming a standard wall, 4 feet or less in height, with gravel base and backfill (and no extensive drainage work), a professionally installed wall might cost $12 to $30 or more per square foot. That's measuring the face area of the wall and including any portion that exends underground. Stone is the most expensive of the standard wall materials, but is also the most beautiful.